Synopses: Part one - Sarah Jane Smith and her young friends investigate some ghostly goings on at the local Lavender Lawns rest home, in the second two-part story of the adventure filled series. With several residents claiming to have seen the ghostly figure of a nun, Sarah Jane, Luke and Clyde pay the home a visit to find out what's going on. They soon discover that there is more to the story when Luke is entrusted with a mysterious alien talisman by Mrs Bea Nelson-Stanley, a resident at the home who knows a thing or two about aliens. As the mystery unravels, the gang learn that the ghostly nun is, in fact, part of an order protecting the Gorgon – a scary alien creature who can turn her victims to stone with just one look. With the talisman an important part of the Gorgon's plans for Earth, can Sarah Jane and the gang stop her, and avoid her deadly gaze? Part two - As Luke and Clyde are held hostage at St Agnes Abbey, the monstrous Gorgon and her sinister group of nuns manage to get hold of the alien talisman from Sarah Jane and Maria, as the drama continues. This brings them one step closer to their evil plan to open a portal and unleash more Gorgons on Earth. With her dad, Alan, turned to stone by the Gorgon's deadly gaze, Maria sets out to get him back to normal before it is too late. Back at the Abbey, Sarah Jane and the gang try to stop the nuns from opening the door to the Gorgons' alien world. 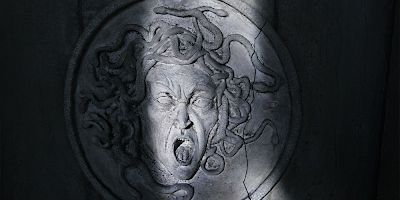 But will they be able to avoid the Gorgon's stony eyes for long enough to save the day? Whatever Happened to Sarah Jane?